I could hardly get out of bed the next morning, which is hardly unusual. I’ve never met a morning I’ve been eager to greet. My body was worn out after yesterday’s journey through town, but I was determined to get the most out of my trip, so I got myself together. I looked forlornly down at my boots. I had strategically aligned them on top of the radiator in the hope of drying them out. This had been a success, but watermarks were left and I was crushed. I love those boots so much. I never knew how difficult suede was to manage. You should never wear them outside! Of course I still do and I always will because you have to make a fashion statement whether you are indoors or out. I am willing to sacrifice for fashion. Once out the door, I made my way down to one of my favorite places in the city, the Martha Stewart Café. This tiny shop inside of the Starrett-Lehigh Building is part of my pilgrimage each time I come to New York City. It’s housed in the beautiful building where the Marta Stewart Living Omnimedia offices are located and my beloved Martha is there constantly. Each time I make the journey, I walk through town lost in a reverie of meeting her as I order my latte. It’s not happened, yet, but I’m sure that if I keep visiting, it’ll happen. This belief has served me well, reader. Something remarkable happened a few days later, but I’ll leave you in suspense until then. Still, I had an intriguing encounter at the Martha Stewart Cafe that morning which I have been thinking about ever since. The walk was brutally cold as the wind whipped up off the chilly waters in the Hudson, and I could hardly wait to have a scalding hot coffee to warm my innards and my hands. I entered the building, sighed happily at the sight of the security guard, the staff, the secured entries, and dreamed as I have a million times of working for Martha. I’m not sure what my place would be on the staff, but I feel like I would fit in extraordinarily well. Maybe someday. After ordering my latte and gushing over the exquisite latte art, I hid my cup as I stirred sugar inside. I hate doing this in front of baristas. I wonder if they are crushed when they see their gorgeous swirls and circles and hearts whisked into nothing? That was probably the hardest part of being a pastry chef many moons ago. I slaved away to make perfect tarts and cakes and whatnot, but it all ends up in sewage. It was pretty tragic. A woman ordered her coffee and for some reason we started talking about the weather. She works for Martha. I gasped in delight, which amused her. We got to talking about our origins and we both come from the Midwest. I cracked one of my usual jokes about the doldrums of living in the plains, but she taught me a valuable lesson. Maybe she’s right? I watched her walk away, scan her badge, and make her way into the inner sanctum of the building with the oddest mixture of longing and inspiration. I keep thinking about her sage comments, and they really have made considerable impact on me. There’s nothing really wrong with Iowa. There’s nothing really wrong with living in the Midwest. There’s nothing wrong with any of it, I just need to come to terms that it’s wrong for me. Just because I don’t respond well doesn’t mean that it’s horrible. There are great and good things here. We have immense diversity in the town where I work, we have a large city nearby with nearly every shop I could want. It continues to grow and flourish. Yes we have Republican nonsense left and right, but aside from that and the endless fields and the humidity and the bugs the size of saucers, it’s all right. I sipped my latte meditatively on my way to the Subway, and soon I found myself at the Natural History Museum. This is another usual New York destination that I’ve somehow ignored. The older I get, the more biased I realize I am with my historical preferences. I care little for the times when humans weren’t around, and I care even less for humans until they formed impressive civilizations. So in an effort to beef up my background knowledge, I’m going to places like this and MOMA. but it would have been rather astonishing to see the plains as buffalos roamed over them and the mountains before roads were blasted through them. Another engaging area of the museum was devoted to various cultures around the world. I had no idea this was there, so it was a great thrill to see artifacts from African cultures. I really do love that place tremendously and I can’t wait to explore more of that continent. I feel foolish for only visiting Egypt, glancing at the Sudan, and napping in a Moroccan airport. I need to see the Kalahari and the lions on the savannah. I want to see apes and lemurs and giraffes and fire ants and everything. I just want to see everything everywhere in the world. There were also dioramas of Asian culture, which I know so little about that I found them wonderfully mysterious. I wanted to wear the beautifully embroidered shirts and I loved the fur coats from a distance. I’d never wear real fur, of course, but I still appreciate the loveliness of them. My favorite spot of the museum, though, was an area dedicated to the understanding of evolution. Here were recreations of various human ancestors. The cast bones of Lucy were awesome to see. And it was fabulous to study all the different hominids that came before us. I tremendously enjoyed my Anthropology class in college, so it was such fun to see examples. I recently had my DNA analyzed, and as you probably remember, I have a tremendous number of Neanderthal variants in my personal genome. At first, this was understandably mortifying, but I became fascinated by this species because so much of it (maybe three or four percent) of my DNA comes from these people. I allegedly have more in my DNA than 98 percent of the tested population. 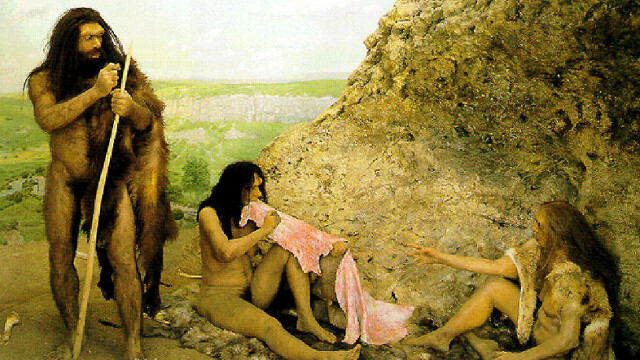 We can never truly know what Neanderthals looked like, of course. All we have are their bones. Experts can do tremendous things with facial reconstructions, but even then, they have to imagine what their hair would look like, what color would be in their eyes, how their skin would crinkle when they laugh or when they cry. But good guesses can be made, and I know that they must be similar to how the life sized figures appeared behind glass. Our conception of these species is rather muddled. Because one of the first skeletons discovered was a gentleman with severe arthritis, the anthropologist who studied it believed that they all must have stooped backs. This was wrong, and when it was understood that the bones showed signs of this ailment, the view changed in the academic world. As is so often true, this image did not trickle into the public’s consciousness. Neanderthals are forever linked with slow, hunchbacked cavemen. I much prefer to think that my prehistoric ancestors were a proud and noble people with gorgeously shiny hair. Bit like a Kardashian, really. These figures did not have flawless Armenian hair, but I was still captivated by their strong, muscular appearance. That’s where my big bones come from, I decided. That’s probably not true, but it’s more fun to imagine. I’m glad that I’m alive today and not a Neanderthal, though. I met Soledad and her friends for dinner. We went to a trendy burger place called Black Tap and it was a delightful time. My black bean burger was delicious and I marveled at the youth and their Snapchat prowess. I use the app frequently, but I don’t have the dedication to aesthetic that they do. They are impressive photographers and can make absolutely anything look interesting. The time soon came to visit the Palace Theatre and to realize my dream of seeing Sunset Boulevard on stage. I could not wait! I quickly found my seat and immediately hated it. The cheap tickets I had bought on Today Tix to War Paint were much better. At tonight’s show, I was in the back of the floor level, and the seats all were at the same elevation, so I saw half the stage and some balding woman’s enormous head. It was infuriating. I didn’t pay this much to study her remaining hair follicles. I let this bother me enormously for awhile, but then I just shrugged. Oh well. Nothing to do about it. Why let myself be annoyed at something I literally cannot control? The woman beside me was splendid. I think she had to be ninety and was draped in furs. Fabulous. Not a very good conversationalist, but she carried a flask in her mink coat, so she was forgiven. Not for wearing skinned minks, obviously, as that’s an unforgivable crime in my opinion, but her penchant for straight liquor enamored me to her. Soon the audience was full and the orchestra began plucking their strings. And then the wonderful prelude music began and I, like Dolly Parton singing “Coat of Many Colors,” went wandering once again, back through the seasons of my youth. I was in Villefranche. I was in Paris. I was at home. I was walking through Los Angeles. I was thriving and having something of a spiritual moment as the music washed over me. My eyes got all watery — probably some kind of allergic reaction to the curtains, you know? — and it was magic. I always forget how profound an impact music and stories make on us. This one has been in my life for so many years, and I had grown accustomed to the idea of never having this chance. So to be in that audience having this rare opportunity was a delirious delight. I did not take it lightly at all. And then Glenn Close came out. I was shook, and then I grew concerned. Her voice was surprisingly weak, and several members of the audience started talking and some laughed. I thought this was tremendously rude, but I think most other people are tremendously rude, so this is nothing surprising. Then it all clicked in my imagination. Glenn’s voice suited the character perfectly when I accepted that it wasn’t Patty LuPone up there belting away. I wanted a big voice, I wanted it to ring through the theatre, I wanted it to soar to the rafters, but as the production neared intermission, I realized, with a single very dramatic tear, that she was flawless. The character of Norma is a woman whose career is ruined by the introduction of talking movies. How fabulous that her voice was not theatrical and perfect, it was exactly what Norma needed to be. There had to be moments of frailty, of weakness, of almost reaching perfection. When she finally sang my favorite, “As If We Never Said Goodbye,” I was on my feet to applaud uproariously. The other characters were fine and the one who played Miss Schaefer was quite good, but they all paled in comparison to Glenn. That’s to be expected. If she could win another Tony for reprising her role, it would have been absolutely deserved. And if Hollywood ever gets around to making a filmed adaptation of the musical, then she must surely play the role. It’ll be wonderful to have that performance recorded for the ages. Everybody needs the chance to see it. Everything was wonderful, reader. The set was intriguingly sparse, covered in wrought iron stairs and balconies, much like a film set. The costumes were amazing, and I would have cut off my right hand to be in possession of Norma’s robe. It was silk and covered in the most decadent pattern. I would swoop all over if I possessed it. I had a perfect experience, but the end was so much fun. In March, shows on Broadway try and raise money for charity. This usually involves the cast coming out after the bows to plead for money and sometimes they’ll mingle amongst us as we file out onto the street. This time, Glenn decided to do a strip tease and auction off the gloves she wore for her character. It started mildly, but soon she was swinging her gloves all over the stage and managed to raise $2500. The streets were packed when all the shows let out, and there was no room on the snow filled roads. Chivalry is long dead, so I had to do mortal combat to make my way down past the theaters to the Subway. It was, of course, nearly impossible to find, so I about froze to death trying to return to my warm little hotel. Back there, I wasn’t very tired, so I opened up my clever refrigerator and had a feast. There wasn’t one in the room, so I improvised by hanging things on my window. The blizzard was fairly cold, so my week’s supply (which lasts about one day for me) of extra sharp white cheddar was safe and sound. I gorged myself to dangerous levels and contentedly went to sleep. Life can be wonderful if you let it be.